That’s my big question that only I can answer. I knew something was going on before I headed to my six week postpartum appointment with my midwife a week ago. I suspected DR, but didn’t want to check it myself and really face reality that I was going to have some real work ahead of me. Work I would not enjoy, look forward to or likely ever really want to do. Why the suspicions? I felt so weak in my core when doing everyday things, but a different weak than last time postbaby. My lower abdomen easily became sore, but different from last time also. Sneezing was very painful. My posture was terrible. I’d consciously sit tall and seconds later I’d find myself so slouched. My belly looked so different from last time-loose skin, dimply and pregnant by the end of the day despite me having just six pounds to lose from pregnancy versus the 15 pounds last time around. My running form felt off, too. My feet were barely lifting off the ground and my paces were so slow despite any effort I expelled. Last Tuesday my midwife confirmed or answered my concerns with a significant diastasis recti diagnosis as measured by me having a four finger gap between my abdominal muscles. After my previous pregnancy my gap was a 1-2 finger gap. Upon arriving home I was neither upset or discouraged by my appointment. It didn’t seem to be that significant. That would come later. After doing some reading on the topic, I realized that my fitness goals and plans really are on hold or need to be modified. I can’t jump into any real training for a longer distance race without addressing this issue or I will end up injuring something else or making the separation worse. My plans to head back to yoga class and use 21 Day Fix to get back in shape and cross train will have to wait as they both use too many core exercises that not only do nothing to improve DR, but can make the DR worse. Now that this post baby issue was jeopardizing my running and my related goals it became personal. I was mad. I don’t have time to do extra exercises. I don’t have time to read books and research what exercises are safe and which ones are not. I don’t need something else to worry about. I know in the scheme of life and real problems this is not important, but we all can be dramatic at times. The next day I had some negative thoughts running through my head. Since I don’t have time to fix this problem, I was going to become one of those mothers who HAD a goal. Who WAS a runner. Who HAD abs-the least of my concerns. Who HAD dreams…before she had kids. It was kind of a dark few hours thinking about throwing away a goal. Then I remembered how insane I become when I can’t run and how much happiness I feel when running and chasing down a goal. I remembered how much better a person I am when I’m focused on improving myself. I remembered how much more patient I am as a mother when I’m being active and running. I thought about the places this goal would take me and my kids and the experiences I hoped to share with them. This goal is not just a selfish goal, and even if it were, a mother can dream and have goals and still be a good mom. Elle Woods was totally spot on about this! After thinking about all of this, how could I not make, find, steal and create the time to fix my DR and get back to my goals and what I love. Going forward I am taking the advice of my midwife and a physical therapist relative. You should always take advice from your own doctor and not from an online blogger with no medical training (that’s me!) Of course other’s experiences are valuable to me and after reading other bloggers and websites, most said running with DR is ok, but I would likely have issues if I didn’t work to fix it. I also read many online experiences that suggest less running is more especially early on. My midwife cleared me to run, but explained some issues I might experience such as leaking urine when I run (not currently an issue for me (yeah!! ), but common with DR and pelvic floor issues) if I don’t do anything about it. She said she could refer me to physical therapy right away or she recommended Katy Bowman’s online videos and her book on DR as a more lifelong approach to strengthening a weakness. If after giving my DR some more time to heal and close along with following Katy Bowman’s work, I still don’t see improvements she can refer me to physical therapy. Check out the time on this…up with baby! 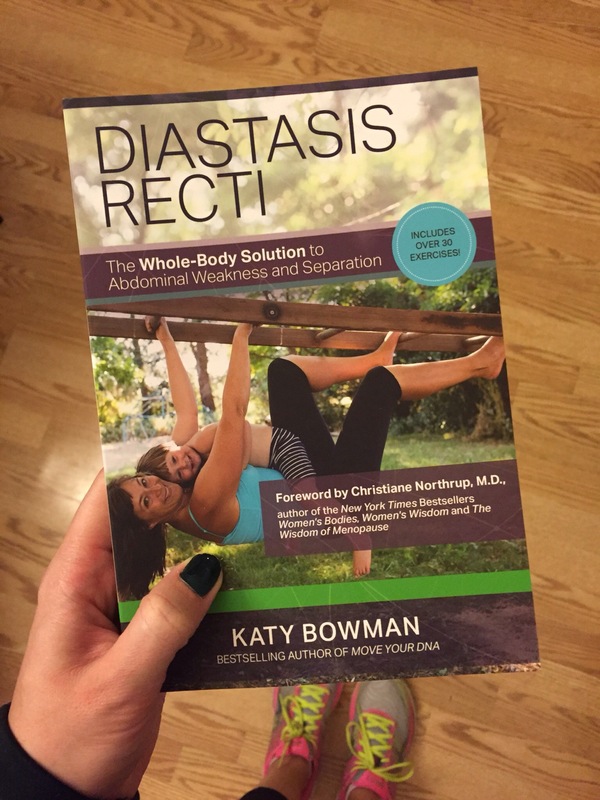 I’ve purchased the Nutritious Movement for Pelvic Health in the digital download version and Katy Bowman’s book Diastasis Recti. Her message is all about “you are how you move.” We create most of our body aches and pains by how we move. Her exercises encourage not a six week program or do these five exercises and your fixed forever, rather change how you move on a regular basis to get stronger and aligned. Her exercises are based on the idea that by changing how we move and doing more moving in general we can make many of our issues go away. I have to admit that so far what she blogs about and says in her book make a lot of sense to me. Let’s just say if her work were candy, I’d be the kid in the candy store. This is also so encouraging because it means I may not have to find so much extra time in my day, rather I could change how I move and see improvements that I will work to maintain as I continue through life. This week I’m also starting to do exercises a physical therapist in the family recommends to patients she sees with DR. She recommended the following websites for fixing diastasis recti and this website for more information on DR. I am hoping that a combination of the above will help me return to my old goals (running long distance races, and someday faster) and achieve my new goal (closing the gap.) As a teacher, I can’t believe the irony of my problem and one of the bigger educational achievement issues in our country. Sometimes you really can’t get away from work! Again, consult your own doctor, please. Here’s to closing the gap!